Eric on The Boss; and Reed on the alarming assault on free press. My new “Think Again” column is called “The (Non-Existent) ‘Center’ Folds.” It’s about the now obsolete notion among Washington insiders that such a thing as “the Center” continues to exist and the damage this does in helping us to understand our world and the Republican desire to destroy almost everything of value in it. But one person who does continue to do his job terribly well, and by coincidence, has the best job on the planet—perhaps the best job in the history of the planet—is Bruce Springsteen. If you want the stats on his 2012/2013 tour, which still has three South American dates left and may return to the States in the Fall, or may not, here they are. The one I find most impressive: 223 songs played. The one I find most ridiculous: “Waitin’ On a Sunny Day” played 128 times. Oh, and speaking of Bruce and burgers, everybody see this? One need not look very hard these days to find evidence that climate change is very real, has already reached crisis level, and increasingly endangers our very existence on this planet. Similarly, events of this past month have offered up incontrovertible proof that the climate of our democracy is suffering through its own man-made crisis, one that is slowly submerging the fundamental rights of its citizens beneath the rising tide of an omniscient national security state. As one of the few lines of defense enumerated in our Constitution, the press plays a critical role in holding back this deluge. So it is particularly alarming to see the press’s ability to freely investigate the government increasingly under assault. And make no mistake, under assault, it is. Indeed, in adding it all up, July 2013 may rank as one of the worst months for the freedom of the press in our nation’s history. As a sad but fitting preview to an awful July, on June 23 NBC News “Meet the Press” host David Gregory engages in a bout of media self-recrimination worthy of a Soviet show trial from the 1930s. Pointedly accusing Guardian reporter Glenn Greenwald of having “aided and abetted” leaker Edward Snowden, Gregory goes on to openly question whether or not Greenwald deserved to being “charged with a crime” for his reporting. This response is doubly counterproductive since the chief antagonist of the press’s freedom is unquestionably an Obama administration intent on carrying out an “unprecedented war on whistleblowers,” as Guardian reporter Glenn Greenwald called it once again on July 2. And over the past few years, this targeting does have a different, more ominously aggressive tone about it. Whether it’s casting an egregiously wide and secret data net over an Associated Press reporter’s phone calls or asserting in a legal brief that Fox News reporter James Rosen was a “co-conspirator” in espionage, national security reporters increasingly find themselves in the government’s crosshairs. It’s a fitting analogy, then. For this “war,” like all others, has resulted in plenty of collateral damage, not the least of which is the freedom of the press. 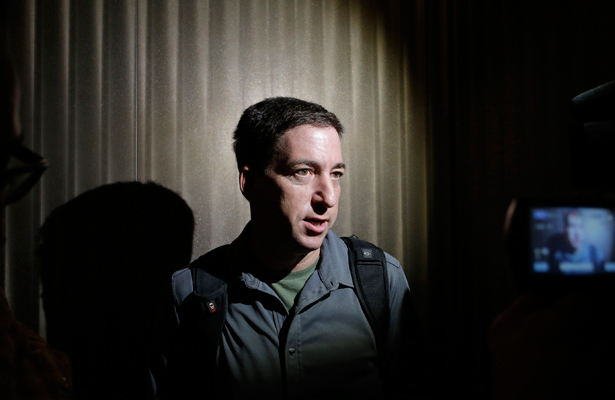 To be clear, to question Greenwald’s reporting is fair game. And troubling questions about the accuracy of some elements of his stories have been raised. But arguing over the details of his reporting is far different than arguing that the author’s very transparent views on the Obama administration gives critics a free pass to ignore his reporting in toto. This circumscribed mindset, which obsesses over defining who is or isn’t a journalist, instead of what is or isn’t journalism, is self-defeating for both our press and our democracy. By attaching journalism’s standing to a person rather than a principle, the press runs the risk of government and the courts undermining the latter while being focused on the former. This decision was particularly galling since it came hard on the heels of new, supposed more press-friendly Justice Department policy guidance for dealing with the media. Drafted in response to the media outcry over the DOJ’s actions in the AP and Rosen cases, the recommendations, which Attorney General Eric Holder rolled out on July 12 seemed encouraging. However, a deeper dive paints a decidedly less rosy picture for the press. For instance, the DOJ memo calls for the creation of a “news media dialogue group,” which brings up the specter of once again relying upon a self-censoring, overly credulous, insider-heavy group of journalists being co-opted by the government. We’ve seen what his kind of too-close relationship has wrought before and it wasn’t pretty. But the memo’s most troubling aspect involves the “heightened standards” for obtaining access to journalist’s work product under the Privacy Protection Act (PPA). Though the new language talks a great game, it actually offers little in the way of new protections for journalists. As this House Judiciary Committee report, released on July 31, ably explains, all the new “suspect exception” guidance does is prevent the DOJ from repeating the outrageous tactic it took in the Rosen case, which was already a willful breach of the original intent of the PPA. And overreach was certainly the watchword of the government’s case against PFC Bradley Manning, which reached its final verdict this past Tuesday, July 30. Having already pleaded guilty to numerous charges for illegally releasing hundreds of thousands of classified documents to Wikileaks, Manning still had to defend himself against the more incendiary charge of espionage and “aiding the enemy.” And although ultimately found not guilty of the latter charge by a military judge, the ferocity with which the administration pursued Manning’s case sends an undoubtedly chilling message to other potential whistleblowers as well as the reporters who might work with them. But as much as these after-the-story-is-out cautionary tales drive doubt and hesitancy in the press, it also matters just as much that many of the investigative reporting tools the press uses prior to publication no longer enjoy an expectation of freedom from government monitoring. In something of a double whammy to individual and press privacy, the last day in July saw the first reports (by Greenwald) of XKeyscore, an even more comprehensive NSA digital spying program, along with a 5th Circuit Court of Appeals decision that upheld the government’s warrantless tracking via cellphone. Couple these events with previous revelations about government collection of email and telephone metadata and the dragnet to stanch leaks and ensnare reporters becomes a daunting obstacle. It is not without irony that, out of fear for their sources as well as themselves, savvy investigative reporters must now routinely adopt the same extreme, low-tech communications tricks and surveillance-avoiding tradecraft as the terrorists our enormous national security network was set up to catch. Simply put, the intoxicating power of having an all-knowing spy agency that suffers little to no oversight is simply too great of a temptation. Sure, the Obama administration will justify its actions under a banner of national security, but over time its never-ending war on leaks and leakers has opened a dangerous new front, one fought on the ground of where they leak to. The Constitution is very clear, however; being an adversary of the government does not make the press an enemy of the state. But if we continue to turn a blind eye to what’s going on, we’re likely to wake up one day to find the freedom of the press has been washed away and, swamped by fear, our democracy is no longer worth living in.